I’m Sally Bell, I’m a freelance writer and publicist the Co-Founder and Director of Harbour Lights Media and I’m based (just) over the bridge in Plymouth. I moved to Cornwall from Australia 11 years ago so that I could immerse myself in the landscape and culture of my Cornish ancestors. Through my writing and voluntary work, I’ve made it my mission to bring stories of Cornish heritage and identity to a larger, broader audience and to foster a greater sense of pride in Cornish identity here and abroad. For the past couple of years, I’ve written about heritage and revived tradition for Cornwall Today; I also write for the Western Morning News and I’ve been a contributor to BBC Radio Cornwall and BBC South West. Being a daughter of the Cornish diaspora I’m inspired by the strength, courage and enterprise of my ancestors who left the Duchy in 1849. 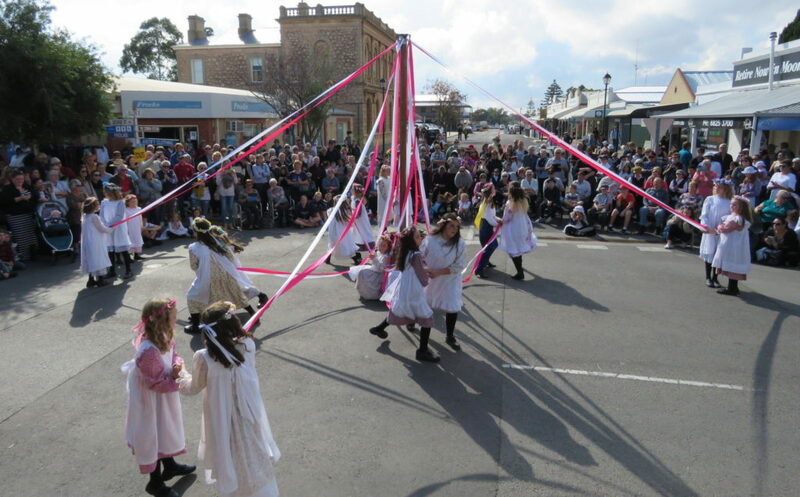 In May 2017, I travelled to Australia to visit Kernewek Lowender, the world’s largest Cornish festival, where every two years 50,000 people including many descendants of Cornish immigrants, get together in an area known as the “Copper Triangle” to hold pasty-making competitions, maypole dancing, learn the Cornish language and celebrate through music, literature and dance. I reported on this for the Western Morning News and BBC Radio Cornwall. I want to remind people in the UK that for people around the world, having Cornish ancestry is a source of immense pride. 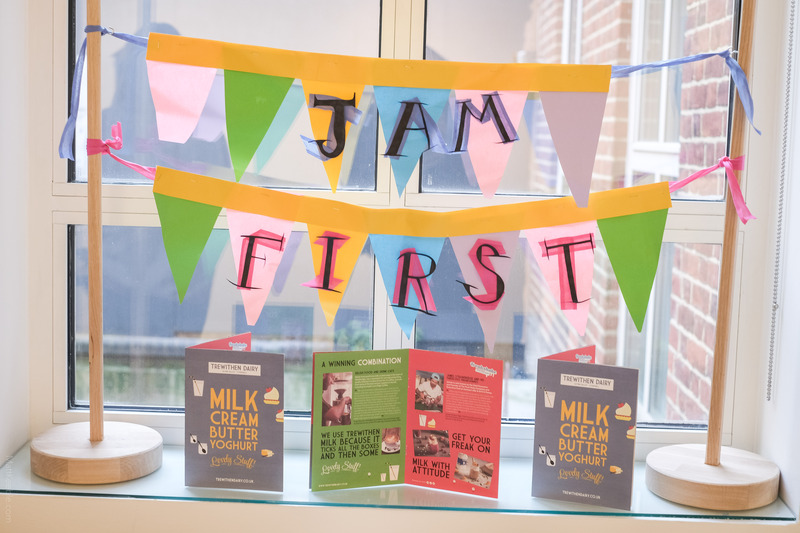 Celebrating Cornish culture connects us to something incredibly meaningful and gives us a strong sense of identity. 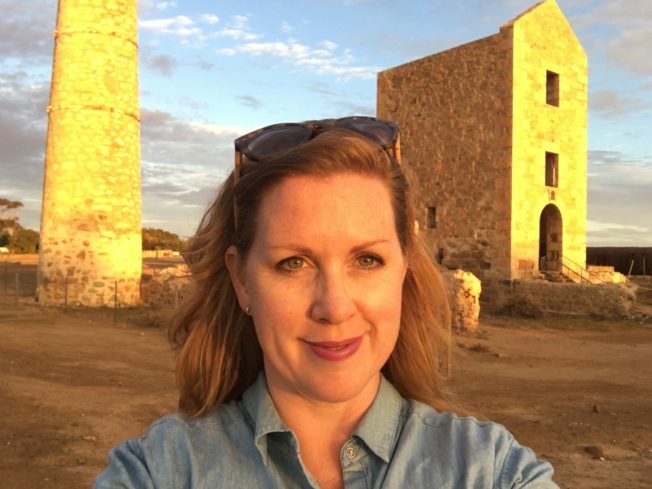 As two of the Cornish Australian copper mining areas are on their way to getting UNESCO recognition, I’m looking forward to helping the South Australian government connect with Cornwall in a meaningful and lasting way. Maypole dancing at Kernewek Lowender. Read about Sally’s visit to Kernewek Lowender on her blog. In addition to my media work I’ve also helped to set up a choir and a film club in Lostwithiel; I sit on board of the Cornish Ancient Sites Protection Network as its voluntary Publicist and I’m also a member of Heritage Kernow, the organisation that creates policy and direction for the use of the heritage landscape in Cornwall. 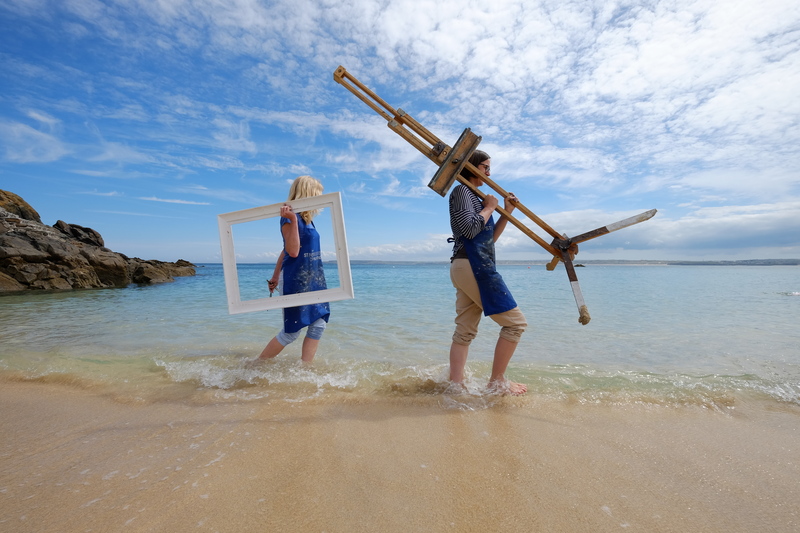 The Happenings page on the Cornwall 365 website and email updates are fabulous – they remind me of the events I’ve meant to book tickets for but have been too busy to do! I’m a huge fan of Cornish festivals – I went to the Great Estate this year and it was a really good experience. Seeing my 9-year-old daughter crank out her hip-hop moves in the Secret Gin Garden was something else. 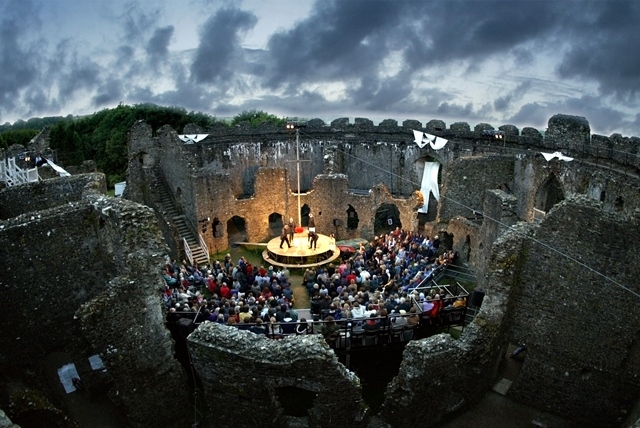 But the best experience I’ve had – mainly because it was life-changing, was seeing iconic Cornish theatre company Kneehigh Theatre’s ‘Tristan and Yseult’ at Restormel Castle back in 2003. I was on holiday from Australia and friends asked me if I’d like to go to the performance. It turned out to be the experience that changed my life and inspired me to move to Cornwall. The combination of a perfect Cornish summer night, on top of a hill, in a Norman castle, with the most incredible theatre performance made me realise that there had to be more to life – on so many levels – and I decided that I had to find out what that might be. Three years later I gave up my job in television in Sydney and moved to Lostwithiel (where Tristan and Yseult had been performed), with my now husband Matt, two Border Collies and a container load of furniture from Australia – and the hope of a new start. Perfect day (in which I conveniently have a helicopter to get me around) would be sitting on the beach at St Ives with lunch at the Porthminster Café, then a lazy afternoon drink at the Rockpool Café at Mousehole, a swim at Sennen then dinner at the Godolphin Arms at Marazion as the sun sets behind St Michael’s Mount. How many can I have? I’d take my husband Matt, playwright and author Simon Parker, Cornish poet and authors Charles Causley, Arthur “Q” Quiller-Couch and AL Rowse, Grand Bard Merv Davey and painter Dame Laura Knight because the conversation afterwards would be extraordinary. 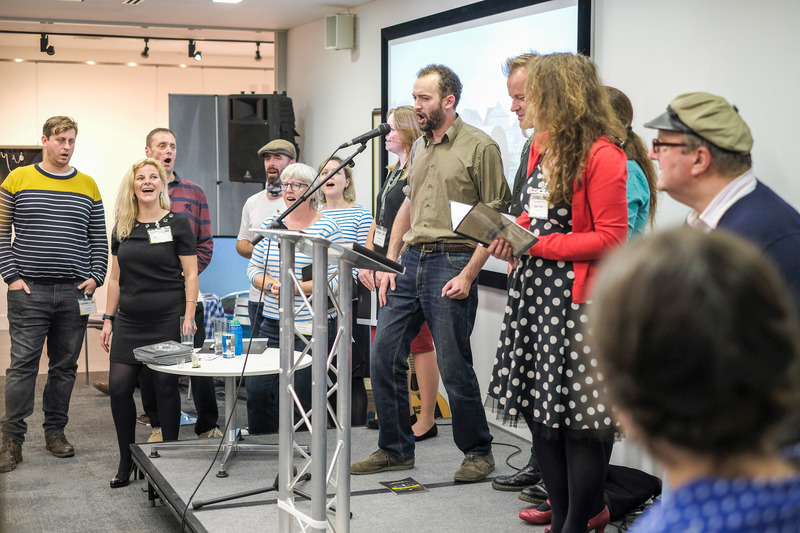 I used to sing with the Eden Project staff choir. In the Core Building, there’s a round room that houses “Seed”, a huge seed-shaped granite sculpture by Peter Randall-Page. Before the sculpture was installed, the choir used to sing in the room and the acoustic was unlike anything else I’ve experienced. But the Minack beats any performance space that I’ve been to – internationally – hands down. I saw Kneehigh’s Tristan and Yseult – for the fourth time – there recently and the combination of the production and the venue was phenomenal. You can’t beat the Eden Project during the sessions – the combination of the spectacle of the venue with internationally-renowned acts is incredible. To stand at the Visitor Centre looking down to the biomes as thousands of people arrive full of anticipation is a hair-standing-up-on-the-back-of-your-neck moment. But I also love the community “Sing Along the River” sessions that take place by the Fowey River in Lostwithiel every summer. Co-ordinated by passionate Producer and polymath Emma Mansfield, these sessions combine male voice choirs, a capella choirs and lots of other great music with locally-made, locally-sourced food and a family-friendly vibe. Singing in Cornwall has been one of the greatest joys I’ve had since I’ve been here – I’ve sung in ancient churches, in fields, at the Eden Project – and I love the way music brings people together. And I have a long-harboured, now not-so-secret an ambition to bring sacred music to sacred sites in Cornwall one day. And – several years ago I was invited to the Kehelland Feast concert near Camborne. There’s nothing like being in a Chapel full of Cornishmen and women singing at full voice. But then again, I can’t listen to Trelawney without weeping so I’m a bit of a lost cause! 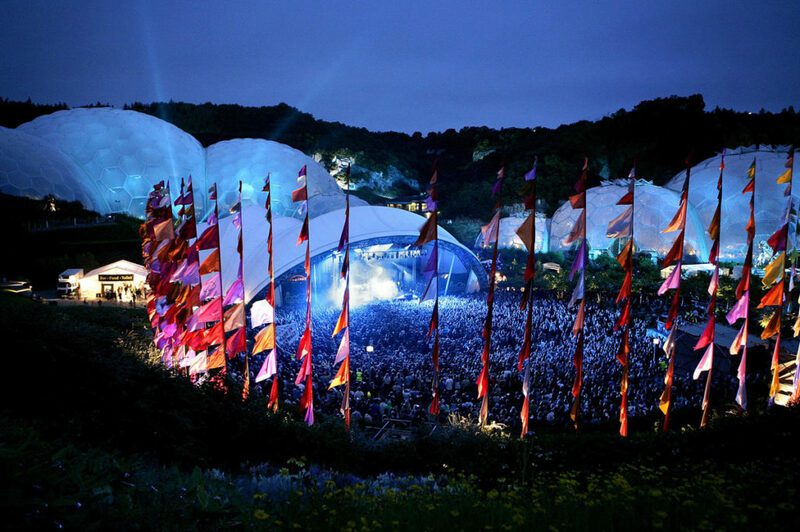 Eden Sessions – Picture by Gabriel Szabo/apexnewspix.com. Each year on the first Sunday in May the “Three Wells Walk” is held in West Cornwall. It’s inspired by the well-venerating tradition of some of the small villages of the area – in centuries gone by my female ancestors along with other maidens of the village would have visited their local wells of in May (for Madron Well it was the first three Thursdays) and made a cross to float on the water, the number of bubbles indicating the years before matrimony. This custom continued right up until World War One. But these places have always been places of solitude and prayer; there was also a tradition of leaving clouties, or small pieces of fabric, tied to the trees around the Well, with the theory that as the fabric disappeared so did your trouble or illness. The Three Wells walk starts at the incredibly beautiful and historic Sancreed Church, then goes past Sancreed Well, over fields to Chapel Euny Well, back to Sancreed Well for a picnic lunch then overland to Madron Well in the afternoon. It’s a real pilgrimage and well-worth doing if you have the chance, especially if it’s being led by local man Andy Norfolk who has excellent knowledge of the area and its flora and fauna. If you have time, take in some of the other ancient sites of the area such as the Carn Euny fogou – West Cornwall has more ancient sites than anywhere else in the UK and they deserve to be enjoyed respectfully. A couple of years ago I was lucky enough to win a meal at Paul Ainsworth’s No. 6 restaurant in Padstow. The combination of a beautiful interior, the best service I’ve ever experienced, and inspired food was unbeatable. And Paul just happened to be cooking that day so we were invited back into the kitchen to have a chat. I feel incredibly proud that we have people such as Paul and many other excellent Cornish chefs who are creating much-needed economic benefit for the Duchy. I’m also a huge fan of Bruce Rennie’s “The Shore” in Penzance, Sam’s in Fowey and the Godolphin Arms at Marazion which surely has the best view in the world. Kit Hill, not far from Callington for the Old Cornwall Society’s St John’s Eve (midsummer) bonfire. There is nothing as spectacular as being on top of one of Cornwall’s ancient hilltops as the bonfires are lit along the spine of the Duchy. The sound of Grand Bard Merv Davey piping in the official party with his double-chantered Cornish bagpipes as the sun slowly sets over Bodmin Moor is unforgettable, and the service in Cornish and English is really quite emotional. And there’s a great singalong at the end which always makes me happy. I have huge admiration for the vast number of community and cultural groups that exist in Cornwall – they battle against all sorts of challenges to pull people together across the Duchy. 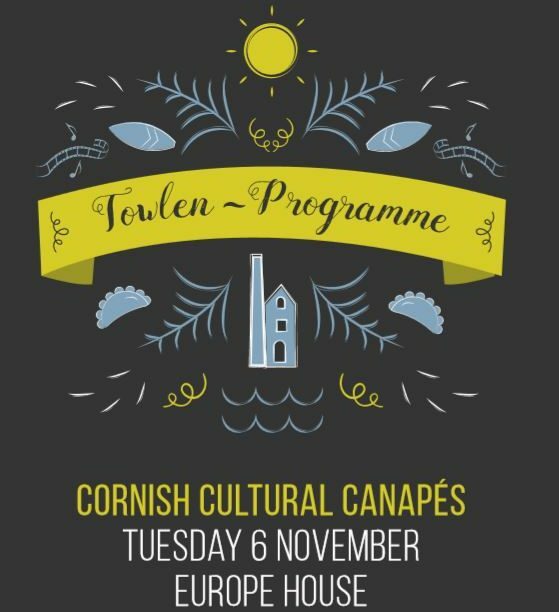 I particularly admire the work of Gorsedh Kernow and the Cornish Culture Association. These groups of passionate people put their hearts and souls into ensuring that traditions are maintained or in some circumstances, revived, and in doing so create wonderful opportunities for local communities to come together. The work of these organisations is far-reaching; attending the Gathering of the Cornish Bards in Wallaroo, Australia in May this year was a really emotional experience. Daylesford, just outside Melbourne in Australia. It’s where my Cornish ancestors ended up after following the trail of mining fortunes from South Australia to Victoria. The streets are full of Cornish names and whenever I’m there I stop at the cemetery to tend the graves of my forebears, who gave up so much so that we could enjoy a better life. It’s a beautiful country town that’s now enjoying huge success as a weekend destination and if I couldn’t live here I’d be there. Even after 11 years of living in the UK I’m told I still have a strong Aussie accent (in spite of my Aussie mates giving me stick for sounding like a “Pom”), so I’m asked on an almost daily basis what on earth would have made me give up Australia for the UK. While I was lucky in many ways to be brought up in Australia, I always felt as if something was missing, like I was disconnected. I’ve been interested in my family history ever since I was a small child and I think there was something in my Celtic spirit that needed to find a sense of belonging that was linked to the land – my land. I found this when I first visited Cornwall. There’s a Welsh word, “hiraeth”, that comes closest to what I felt. There’s no direct English translation, but it’s described a feeling of homesickness tinged with grief. 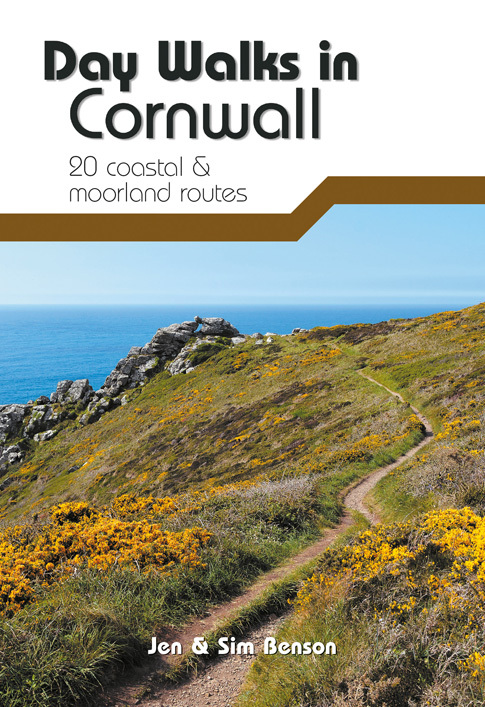 A sense of longing and yearning for a place that just won’t go away… that’s how I felt when I was away from Cornwall. And I’m not under any illusions; I know that for many people in Cornwall, life is very challenging – foodbanks in Camborne can’t cope with the demand currently put on them – but I also think that Cornwall is so special, it has such a distinctive identity, and it requires promoting and protecting. I’m looking forward to continuing to find creative ways of doing this and helping Cornwall link up with its diaspora in meaningful ways.